This book offers 365 meditations on the attributes of God - His sovereignty, wisdom, goodness, power, righteousness, and more - in readings from some of the most insightful Christians of the past two thousand years. 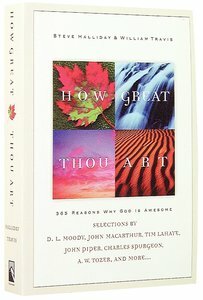 Now in paperback, How Great Thou Art offers 365 daily readings that each describe a facet of God's glorious character. Featuring the words of some of Christianity's best thinkers from the past two millennia, this powerful devotional addresses believers' desire to know God more fully and more personally. Uplifting and easy to read, each devotional offers a related Scripture and inspires a confident walk with the Most High. How Great Thou Art invites you to explore God's character through 365 insightful daily readings gleaned from Christianity's best thinkers. As you discover his divine traits, you will come to know the Father more personally than ever before.